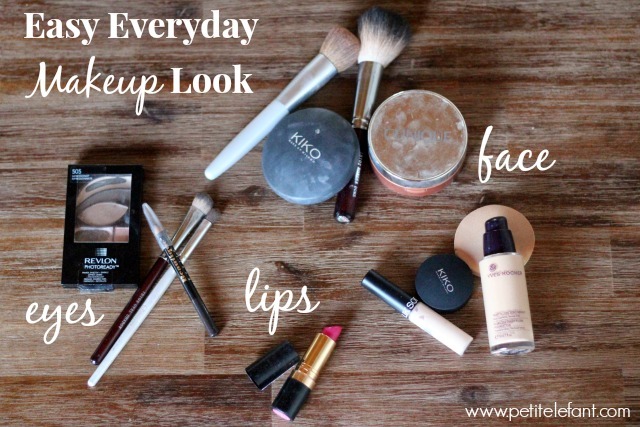 It’s completely realistic to get gorgeous in the morning with a an easy, everyday, 7 minute makeup look. It’s true. Stay with me. Work, school, kids, dinner, housework, family time. These are just a few things that take up life, often we probably even have more to add to the list. Just because we’re busy doesn’t mean we can’t make time for ourselves, though. I don’t know about you, but when I make the effort to, put on makeup and attempt my hair I feel so much better. I’m actually a lot more productive! I have whittled my makeup routine down to 7 minutes. That’s right, seven. How do I know it’s seven? Well, I timed it. I wanted to make sure I wasn’t lying to ya’ll. Oh and I had a couple of little boys interrupting me to check on their dinosaurs, so you might even be able to knock this out in less! Here’s what I used for my 7 minute makeup routine. You can most certainly adapt to what you have or what works for you. Eyes: Revlon palette. I love these palettes but the one I use the most is called Impressionist. It’s simple browns with a primer right there in it, simple & great for everyday. For day to day I usually use the lightest brown in the crease and the lightest cream on the lid and brow bone. Bam. Face: I start with some concealer. What I’ve been using lately is Sonia Kashuk at Target. I use it under my eyes and on any blemishes as well. My favorite foundation is Clinique but in France I can’t find it at a reasonable price so Yves Rocher it is. I use a sponge I got at Target and blend it all in. I use a Clinque bronzer for blush or this e.l.f. blush. Pictured today is the Clinque. Then I have a powder that I lightly brush all over to blend & seal. I bought the brand shown here at a store only found in France, but any powder that matches your skin tone (or is translucent) would be perfect. Lips: I keep it simple with my lovely Fuchsia shock by Revlon. It goes on so soft and silky it feels like chapstick, but as you can see from the photos below, it adds so much! A couple extra tips for your 7 minute makeup look: I actually start with my eyes because when you’re using eye shadow it can fall onto your cheek bones. You don’t want to mess up your fresh foundation! Keep under your eyes bright and the blush on your cheekbones! And make sure that the foundation is blended into your neck. You definitely don’t want a visible line! I feel like blush is a must have. Look at the difference on the second line, with and without blush. I look like a vampire before! If you’re looking to cut time even more, try a tinted moisturizer (my favorite is CoverGirl) and a tinted LipBlam. Do you also use eyeliner and mascara? What kind? Looks great but either you have tattoo eyeliner and lash extensions you didn’t mention those and that’s what is the most noticeable and stunning part of the pics. Do tell.